People often ask the question "What should we wear?" and honestly so many of my clients nail it - bright colors, great prints, coordinating beautifully. My first advice is to trust your gut! Often times people over think things but if you trust your instincts and go with what you love, then everything will work out just fine and look fabulous. Bright colors are great and photograph well, especially in the springtime when the grass is green and the flowers are starting to bloom. I put together two different outfit sets, since I haven't done this in awhile, both for a family of three. I love this first set, and I would tuck the woman's blouse in to give it a more polished and flattering look. I would also roll the sleeves up on the man's shirt (which you could tuck in or leave out, depending on your style). You'll notice the flower print AND the plaid - they work together because they are similar in color, so don't be afraid to mix it up. This second look is super fun with one of my favorite color combinations right now - orange and navy. 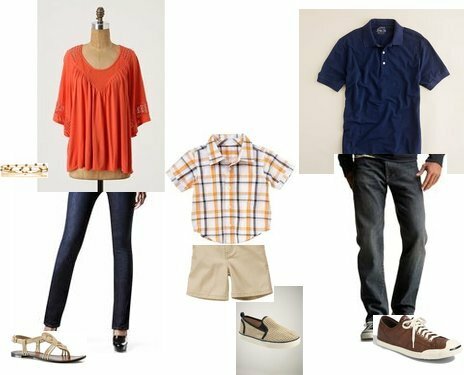 This set has a more relaxed, casual vibe and I think the little boy's outfit is just adorable (love the shoes!!). I also found this super cute nautical dress for a little girl for a family of four (or if you have a girl instead of a boy).